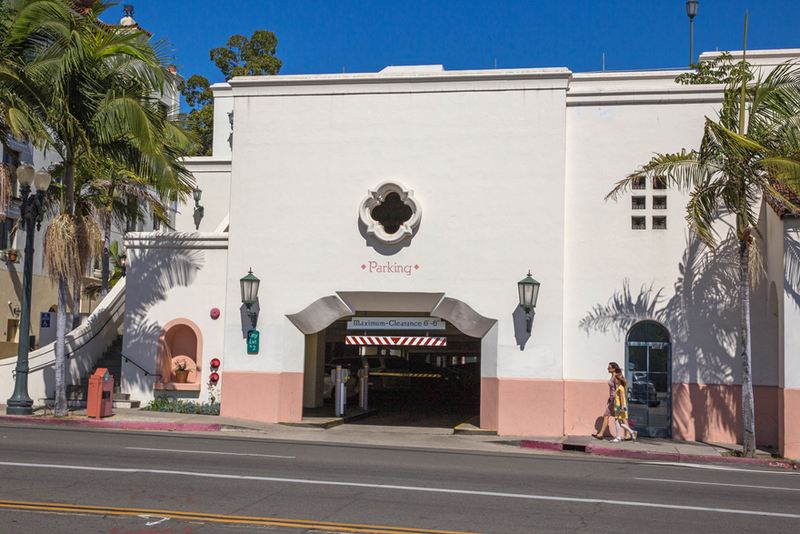 Although State Street is struggling with retail tenant vacancies and the presence of aggressive panhandlers, downtown Santa Barbara has one asset that people agree is key to the area’s success: The ample availability of parking. Santa Barbara manages nine parking lots and five parking structures with more than 3,000 parking stalls. More than 5 million vehicles park in the facilities annually. The city has spent tens of millions of dollars of Redevelopment Agency funding on parking structures and improvements, starting when the RDA was created in the 1970s. In addition, Downtown Santa Barbara businesses assess themselves to subsidize the “free parking” that customers experience. Today, city-run lots offer 75 minutes for free (previously it was 90 minutes) and charge $1.50 per hour afterward. The Downtown Parking program is designed so people can park once, and the Metropolitan Transit District downtown trolley is one way they can make their way up and down State Street to the waterfront and Stearns Wharf. Nowadays, the parking structures are equipped with a real-time digital map that allows people to see parking availability without having to drive into the lot. “It is one of the things that Santa Barbara has done well over the years,” said Ken Oplinger, president and CEO of The Chamber of Commerce of the Santa Barbara Region. The city’s 1964 General Plan called for narrowing State Street to two lanes (from four, with on-street parking), creating a parking district, and closing part of State Street to vehicles. Around that time, downtowns around the country saw the need to add more parking to compete with the threat of suburban malls, said Dave Davis, the city’s former director of the Community Development Department. While the issue of closing part of State Street frequently comes up as a proposal, it has never been tested. He said Santa Monica’s Third Street Promenade, a pedestrian mall, works because it is a smaller area and it runs parallel to the beach. “As I talk with business owners, I am not seeing a lot of support out there,” Oplinger added. Parking is plentiful and affordable downtown, but it’s a different story in the Funk Zone, south of Highway 101 and east of State Street. Some businesses, including The Lark restaurant, rely on private valet services to park customers’ cars. Many Funk Zone visitors park farther away and walk, or use a rideshare app to get there. As the Funk Zone grows, so, too, will the challenge of parking there. Victor Garza, supervisor of the Downtown Parking program, points to the city-run Amtrak train station parking lot at 209 State St. as an option for Funk Zone visitors, and noted that the new Hotel Californian at 36 State St. includes a recently opened parking structure with public parking available. Some of the spaces in the 300-spot lot run under the same city prices with 75 minutes free, he said. Noozhawk’s Reimagine: Santa Barbara project is exploring the challenges and opportunities in downtown today, and will be working with you, our readers, to identify priorities and form a vision for State Street’s future. It’s not just about shopping or dining, but finding out what locals want for the next generation of State Street and the downtown experience. Should the city incentivize more housing projects in the downtown core, or get into the development business itself? Should business organizations work with property owners to curate more locally owned stores? How can stakeholders work together to come up with innovative solutions for large properties like Macy’s in Paseo Nuevo and Saks OFF 5TH, which is vacating its store on State and Carrillo streets when its lease is up in the spring? Have an idea? Have questions? Join the conversation in our reader-engagement platform, Noozhawk Asks. Noozhawk managing editor Giana Magnoli contributed to this story.